It’s the calm before the storm. Prices of lots of the rares/mythics being reprinted in Modern have recently started to take a dip in value, and with the format becoming the talk of the town later this summer thanks to a Modern PPTQ season and Modern FNM promos, it looks like Wizards won’t be making people complain for too long. After missing an obvious printing in MM2 Serum Visions was revealed to be a FNM promo, and with Battle for Zendikar not too far off, I think we can count a majority of the missing cards from MM2 to be in either that or Origins. So which common and uncommons cards that didn’t appear in Modern Masters 2015 should you be focusing on? Well, let’s talk about that down below. (For my Original Uncommons article, please click here) Boy did I get thrown for a loop. I thought there would be a lot more uncommons in this set from my list, but quite a few of them are nowhere to be seen. Luckily I was right about Dismember coming back (and why shouldn’t it since most of the other Phrexian Mana spells are being reprinted? ), and Remand is also being reprinted at uncommon as well. Remand is definitely welcome, and I expect it to follow Spell Snare’s price trajectory in the coming months. Its price will take a dive, but that should help players put together a Splinter Twin, Delver, or blue control deck more easily than before. I also managed to get Artisan of Kozilek, Gut Shot, and Dispatch correct in my previous article, but that was about it. There were an incredible number of uncommons that I thought we’d get, but were mostly passed over and not included in MM2. Some archetypes I went with didn’t pan out (such as TRON, Infect, and Zoo), but I find a lot of the choices for MM2 strange, mostly because they would have been great in the archetypes WoTC is pushing. Take Affinity for example. You think they would have more enablers for Affinity such as Memnite and Signal Pest, but instead we have more of an old fashioned Affinity limited deck that will play Frogmite and Myr Enforcer. Memnite is a card locked on the Mirrodin plane and that I don’t see getting reprinted until the next Modern Masters set at the earliest. There is a small chance we could get an Affinity Modern Event Deck, but I don’t think that will be likely.Signal Pest’s Battle Cry is also going to be hard to reprint in a regular set since it’s a special keyword. We might see both of these cards reach $3-4 if Affinity takes off after MM2. I can understand not reprinting Noxious Revival because it would fit well in a Miracles type deck with Snapcaster Mage in the next Modern Masters set in a few years, but why no Urza Lands? With Eldrazi and Karn, why don’t we have a faster way to push out big creatures? Was it deemed too powerful in limited? I doubt we’ll see those cards in any other set until MM3 comes out. I think lots of people were also disappointed that Twisted Image and Deceiver Exarch weren’t part of the Splinter Twin archetype. They reprinted Kiki-Jiki, but don’t have any way to go infinite. At least in the original Modern Masters set, you could draft a pretty potent storm deck that could kill with a decent sized Grapeshot. Whipflare was reprinted in the red 2014 Commander deck, but what about Beast Within? Beast Within seemed like it would have been a powerful card to reprint in MM2 as well, but I wouldn’t put it past being reprinted in a future expansion like Battle for Zendikar (BFZ). Aven Mindcensor was another card that really needed an obvious reprint but didn’t get it. This leads me to believe it will be in a core set like BFZ as well, though I would think they would change the rarity. The same can be said about Inquisition of Kozilek and Forked Bolt. Both could be back in this fall’s set. I’m split down the middle on the cards that were reprinted in this set. I agree with cards like Dispatch, Dismember, and Electrolyze being reprinted in the set because it brings down their value and makes them easier to get a hold of for decks. I also think that making Lightning Bolt and Cranial Plating an uncommon was a good call. There is simply no way either card will be in a core set again due to their power level. There are also some cards that I think operate well in a limited environment and needed a reprint, thus killing 2 birds with one stone. Expedition Map, Everflowing Chalice, and Remand are good examples of this. I’m even willing to accept some of the reprints of cards that add to the synergy of limited play, such as Tezzeret’s Gambit, Devouring Greed, and Glassdust Hulk. I am not convinced, however, on the reprinting of cards that obviously could have been replaced by a much more superior card. The Ravnica bounce lands are a good example. Why wouldn’t you reprint the Signets instead? It seems like they would have been a much better way to fix mana while also helping with mana ramp a little bit. There are also quite a few random inclusions in the set such as Pillory of the Sleepless, Root-Kin Ally, or the hodgepodge of Hybrid Mana cards that seemed to have little rhyme or reason to how they were picked (for example, why was Shrewd Hatchling chosen and none of the other elementals?). I think some of these cards could have been switched out for other cards in need of a reprint that added to the already defined archetypes. I haven’t had a chance to really sit down and dig into the set for my limited article yet, but something tells me that there are going to be a few subpar cards. (For my Original Commons article, click here) I did much better with my common choices than I did with my uncommon ones. For starters, I was right that Lightning Bolt and Cranial Plating would get a reprint, and I even called that Cranial Plating would be released as an uncommon. Serum Visions was at the top of my list, but since it’s going to be a FNM promo we can consider that a reprint as well. Mana Leak is another common card that shouldn’t disappoint anyone, even though it isn’t an ubiquitous card in modern. 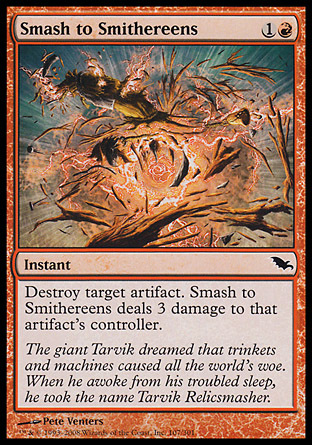 Smash to Smithereens is also a very welcome reprint for many red deck players, especially burn decks, and which Affinity Deck would be complete without Thoughtcast? Other cards I chose correctly to be reprinted were Vines of Vastwood, Frogmite, Rampant Growth, and Vapor Snag. When Mark Rosewater said Infect wouldn’t be an archetype in MM2, that pretty much ruled out Glistener Elf and Blighted Agent. There were also quite a few longshots in my list as well and I’m not the least bit surprised they didn’t show up in MM2 (Coiling Oracle, Unmake, Terminate, Chromatic Sphere, Soul Warden/Soul’s Attendant). However, why didn’t we get Gitaxian Probe? This card is going to be downright impossible to reprint outside of a special set such as Modern Masters 2, and I’m not sure a Duel Deck printing will help it. Other cards that I think would have been right at home in this set are the Ravnica Signets (mana fixing for everybody and ramp for big mana decks), Galvanic Blast and Vault Skirge (for Affinity), and Slippery Boggle along with any of the Rise of Eldrazi Umbras (such as Hyena Umbra). If the Umbras are returning with the Zendikar block this fall then fine, but otherwise Wizards missed a prime opportunity to make Boggles deck work and give some use to an absolutely pointless Daybreak Coronet. While most of these cards aren’t poised to see significant gains in value other than Gitaxian Probe, there are a few cards you should consider picking up as their price will only go up as supply dwindles. I personally like Qasali Pridemage as I don’t think we’ll see Exalted in any other blocks for a while, and he can fit into a number of sideboards (Junk, Collected Company, GW Hatebears, etc). Slippery Bogle is another common that might not be back anytime soon due to an outdated ability (Shroud) and could see a slight price increase. It’s the name sake of the deck, so I wouldn’t be surprised to see a lack of supply push its value up (even if it’s a tier 2 modern deck). While most of the commons feel right at home in a modern set (Court Homunculus, Smash to Smithereens), I feel like there are some random commons that would be better off in a core set like Origins or M15 (Mighty Leap, Plummet). There are also quite a few reprints from the first Modern Masters set as well, such as Aethersnipe. For the most part I think the commons have good synergy with their archetypes, but at the same time I feel like the power level was kept deliberately low. Okay, we get Lightning Bolt, but I felt like Fiery Fall was only “serviceable”. I’m not going to whine about all of the cards though. Apostle’s Blessing and Gut Shot at common are welcome, as well as Scion of the Wild and Vines of the Vastwood. We could possibly see Shard Volley in BFZ this fall, and the Umbras might be back too. It’s just that I felt like there was too much emphasis put on “building a synergistic limited experience” and not enough put on “reprinting staples to lower the entrance into the Modern format”. In the next set I think it will very important to balance both of these as to satisfy both the casual modern player that likes to build decks and cube with friends, as well as the serious players that are looking to play competitively. Now that I’ve followed up my articles from December and have had some time to go over MM2’s set list, the next step for me is to start breaking down the set in my Limited strategy series “Playing to Your Weaknesses”. This is going to be an incredibly challenging test for me, as I haven’t played with many of these cards before in any kind of setting, and only know how to play some of the MM2 archetypes. Having played against some of the decks in Modern will also help, but when you’re using sub-optimal cards and less than a playset of others, you’ll have to be clever and make concessions to give you an edge. I’d like to thank those of you that took the time to read my follow up articles, and I’d like to welcome you to check back in a few days for my first Modern Masters 2015 Limited Article talking about all of the white cards in the set. If you have any comments, or would just like to complain about what was or wasn’t printed in MM2, please feel free to vent down below! Thanks again and see you next time.